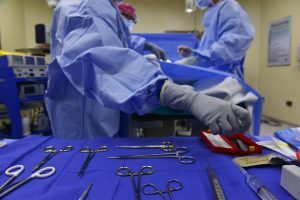 Even if you’ve never needed a surgical mesh implant, you’ve probably heard about a number of lawsuits due to problems patients are having with them. One type in particular has been the transvaginal mesh (TVM) implants in women. These TVM lawsuits are well underway, with tens of thousands of lawsuits currently pending. However, it appears another influx of lawsuits involving more surgical mesh implants are appearing on the horizon: surgical mesh used to treat hernias. First off, let’s briefly explain what a hernia is. A hernia appears when an internal organ protrudes through a wall of tissue (often a muscle) into another area of the body where it doesn’t belong. Depending on how bad the hernia is, surgery may be required to fix it. Because hernias involve a hole in a muscle or other tissue, additional reinforcement is usually needed to close the opening and keep it from reopening. This is where surgical mesh comes in. The mesh often takes the form of a plug or sheet of biological or synthetic mesh and is surgically implanted over the hole. Clinical studies have shown that using surgical mesh to treat hernias reduces the chances of the hernia returning. Each year hundreds of thousands of hernia surgeries are performed. Given their proven effectiveness, it’s no wonder that many of these surgeries use a surgical mesh. Unfortunately, a significant number of the meshes have serious flaws.